Aegeus-Society for Aegean Prehistory, established in 2009 and now counting more than two hundred members, is a non-profit organisation focusing on the study, research and dissemination of the prehistoric archaeology of the Aegean and Cyprus. Aegeus is building a forum for open communication between researchers of Aegean Prehistory, and anyone with a particular interest in that period; taking advantage of the possibilities offered by new technologies and particularly the Web, a new mode of cultural expression and communication is promoted. Our site www.aegeussociety.org, a constantly updated source of all things related to Aegean Prehistory, is the main portal for exploring Aegeus’ activities and a venue of interactive contact between our members, who can use it to create their own personal webpage and present their research. 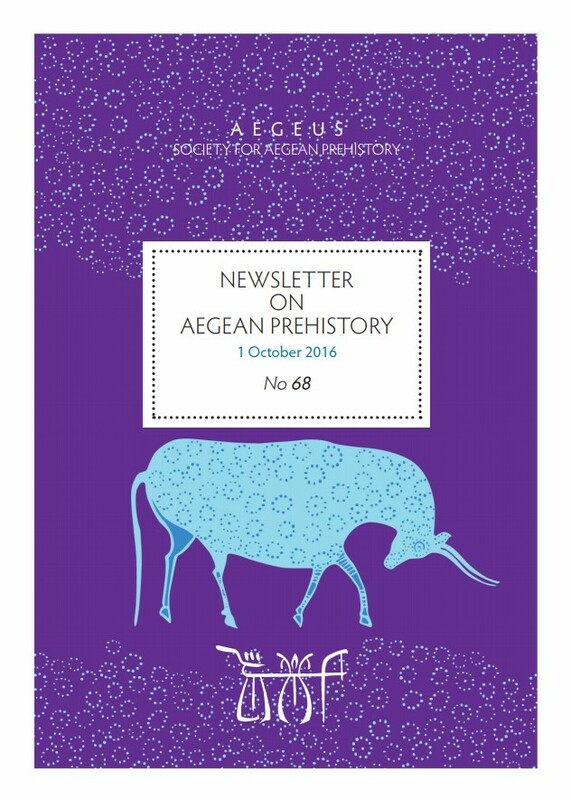 Further privileges enjoyed by Aegeus’ members include advisory assistance by fellows and other members, discounts on Aegeus’ activities, and most importantly the monthly receipt of the digital Newsletter on Aegean Prehistory. Our newsletter offers the most up-to-date, detailed information on all recent news about Aegean Prehistory, including new publications (books, book reviews, papers, online articles), recent dissertations, upcoming scientific meetings, conferences and lectures worldwide, calls for papers, job and scholarship advertisements. 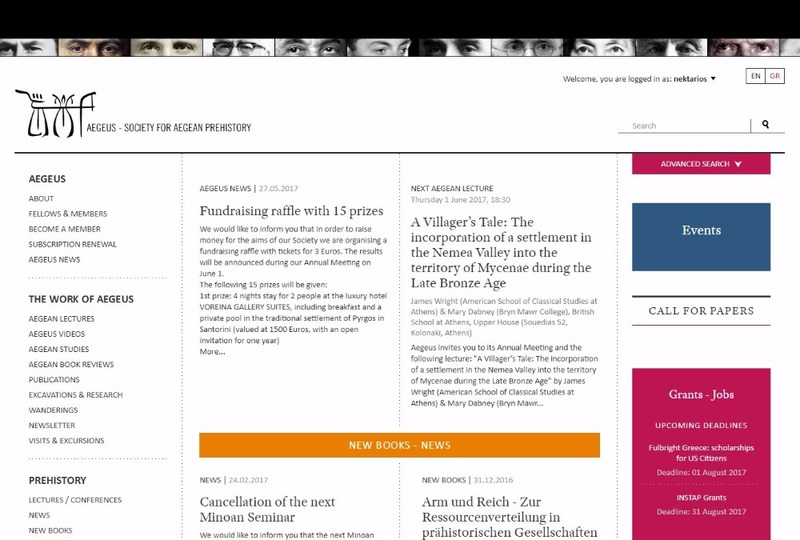 Exploring www.aegeussociety.org, you may find past newsletters freely available for download, as well as the rich digitised archive of Aegeus’ Digital Library. Finally, Aegean Studies, Aegean Book Reviews, and the Aegean Lectures are a core part of Aegeus’ activities. Aegean Studies is a new bilingual (Greek-English) peer-reviewed journal on Aegean Prehistory, focusing especially on papers presenting new theoretical approaches, innovative means of data analysis, interdisciplinary contributions, as well as studies for the promotion and management of prehistoric culture. Aegean Book Reviews forms a part of Aegean Studies dedicated to current scholarly publications in Aegean Prehistory and related fields. Both the papers of Aegean Studies and the Book Reviews are initially published electronically on the Aegeus’ website and later will appear collectively in a printed volume. 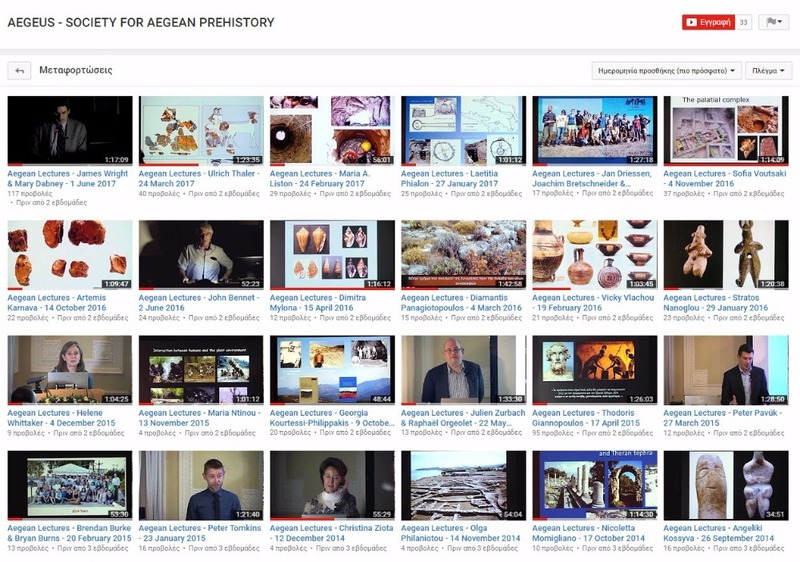 Aegean Lectures (online: https://www.youtube.com/channel/UCoCVi6c172JThoDJ2kkEE3g ) are organised in collaboration with the Swedish Institute at Athens and aim to present new findings, new excavations and new research studies on Aegean Prehistory. Our hope is to signal a new approach towards open communication between the research community and the public, to promote the dissemination of excavation data and the understanding of the excavation process itself, as well as to explore research themes and areas of Greece that have not been widely known to the archaeological community.